I am so excited to share this post with you! It has been weeks in the making. You all know that I am an advocate for eating whole foods, those foods that nourish the body, mind, and soul, but you may not know that I am also a certified holistic health coach! I guide and support clients in reaching their health goals, whether it be through diet and exercise or through other facets of their life. While each client's needs are different, my approach is similar; I encourage small, sustainable changes that can lead to big health transformations. I am in process of designing the health coach portion of my site, so you will have to stay tuned for more details, but in the meantime, I am rolling out a program just in time for the holidays! 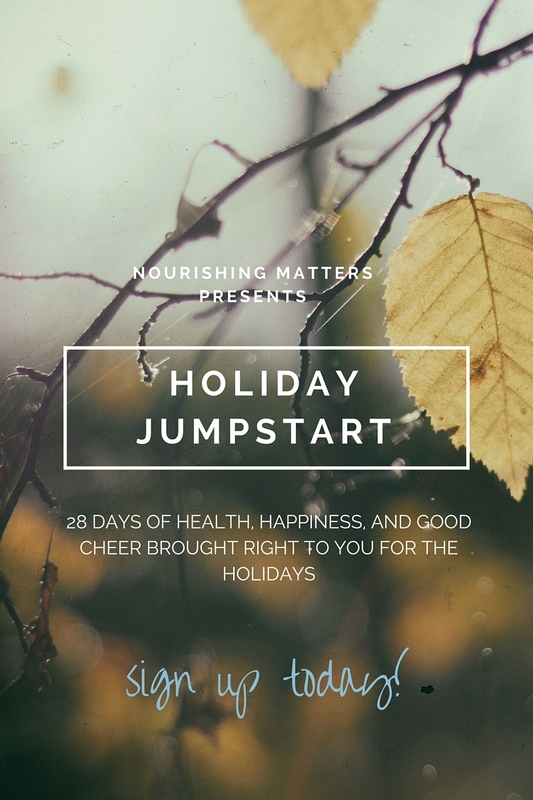 I am calling it Holiday Jumpstart because I want to help you get a healthy start to the holiday season! We may also be doing a little jumping...;). You can read more about it here, and you can sign-up right now by filling out the form! It is not meant to be a drastic weight-loss program or extreme detox, but I designed it to help guide you through the holiday craziness and make healthy achievable! It is not just recipes and healthy eating tips; let's be honest- health magazines and Google do that. It is much more interactive and therefore much more effective in helping you be your best self. I promise it will be fun! You will be motivated all along the way by me, your cheerleader! Did I mention that you get a little gift for joining along? And that you have the chance to win an even bigger gift at the end of the program?